Two weeks after Donald's death, the KaMo Sports Jumpers returned to Northern airport. Unfortunetly, they would lose another member that day. They would jump at Northern airport no more. Danny Payne, who was a leader in skydiving, and headed the KaMo club, began a new club at the Richard Cobowers airport, but it didn't last. The airport no longer exists today. 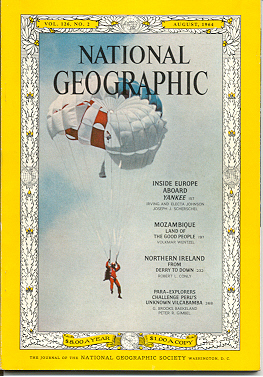 I was told that Payne was on the cover of National Geographic in 67' or 68', when they did a major story on skydiving in the United States. *UPDATE* 06/13/01 - Found the National Geographic magazine cover issue for August 1964. Danny Payne is pictured skydiving here. The related skydiving article within (which actually has nothing to do with Mr. Payne -- he simply modeled for the cover) is entitled "By Parachute Into Peru's Lost World". The main title for this issue is simply known as "Ireland". As for the remaining KaMo members, from what I understand, everyone just kind of went on their seperate ways. Some kept in touch, some did not. The two deaths back to back after a nine year no fatality record proved too much and as if overnight, KaMo would die right along with them. 06/09/2001 ~ After publishing this page, I went on to link it to some search engines. I had searched for KaMo prior to this site's creation, and come up empty, so when I returned to these search engines this evening to check the status of this site, I was expecting to either come across nothing again, or to the very least, come across my own link. *Reminder that KaMo ended in 1968, after the 2 fatalities. SKYDIVEMRVS has been in the same location for last 29 years! In viewing their site, they not only focus on the sheer joy of skydiving, but in doing so, stress the safety of the sport. I am proud to share their link here. DISCLAIMER: All information provided here was either gathered through newspaper articles or personal accounts of persons involved with KaMo in some capacity. There have been discrepencies I have come across along the way, so please understand that the information you find here is based on that of The Kansas City Times, as well as these personal accounts. Should you have any information to which might further clarify or add to the KaMo Club story, please contact me. Thank you.